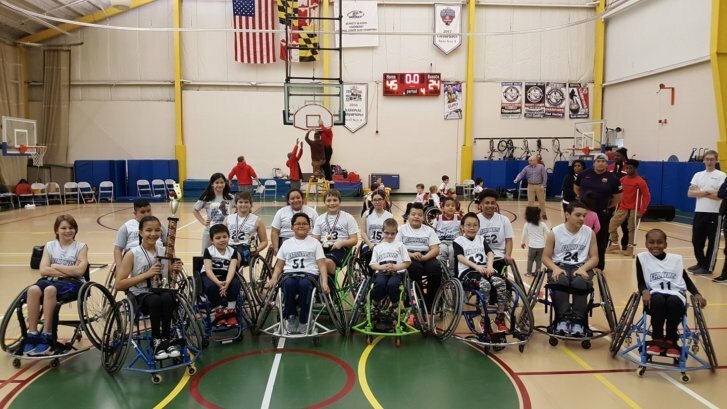 The all-volunteer youth wheelchair basketball team continues to grow and improve, but could use a helping hand to get to its signature annual event. FAIRFAX, Va. — The Fairfax Falcons don’t want to be your sob story. They’re not looking for your pity, or your sympathy. But if supporting them in their quest to win a prep-level, national wheelchair basketball championship next week in Louisville, Kentucky, is your kind of thing, they could use your help. As you might expect, the player pool for their sport is a lot more limited than traditional basketball. They’re the only program between Richmond and Baltimore, drawing kids from all over the greater D.C. area, from Bowie to Frederick and deep out into the Northern Virginia suburbs. That means monthly tournaments involve some travel around the mid-Atlantic and often involve playing the same teams over and over again. Nationals is their one chance a year to not only play against fresh competition, but watch teams all the way up through the adult leagues at the top of the sport. “Nationals for them is a great motivator, because there’s all levels of play,” Lisa Rode, one of the team’s organizers, said. The Falcons have been around some 25 years, but the program wasn’t competitive till about a decade ago when Rode and her husband Eric, who played growing up, reinvested themselves with the team. The Falcons first qualified for nationals four years ago, spending every moment they weren’t playing sitting on sidelines watching other teams play, soaking it all in. The Falcons draw from a diverse set of families. After all, disabilities don’t discriminate by race or social class. They’re also coed, with no traditional limitations of male or female participation. There are roughly 30 kids ages 5 to 18 involved over the three levels of the program — varsity, prep and novice. Their program falls under the Fairfax County Neighborhood and Community Services therapeutic recreation division. While that provides valuable access to gym time, it doesn’t mean they’re a highly sponsored or well-funded youth sports organization. “The cost for adaptive sports adds up because of the use of specialized chairs and travel,” Rode said. Chairs equipped to compete are expensive, but the Falcons charge just $25, $35 for nonresidents, and are an all-volunteer program. That makes them accessible to nearly any family interested in adaptive sports, but also means they’re on their own for big trips, such as nationals. They’re more than 85 percent of the way toward their $8,000 fundraising goal as of Thursday night. Rode is working to get a 501(c)3 set up, but for now such efforts are supported through crowdfunding. This is the fourth straight year the team has been to nationals, but they’re looking to build off last year’s eighth-place finish, coming in as the five-seed with intentions on winning it all. “I think we can make it and win the championship,” said Kidus Ali, the prep team’s point guard and a seventh-grader at Hayfield Secondary School in Alexandria. Ali has been practicing with the team twice a week since first grade. He is dual-rostered on the prep team, playing up a level with older kids on occasion, and has designs on continuing in the sport. “I want to, when I grow up, play in the Paralympics. I want to get a scholarship,” he said. There are about 10 schools around the country that play wheelchair basketball at the collegiate level, some offering scholarships. The closest is Edinboro University in Pennsylvania, but the list also includes large public schools, such as the University of Missouri, Auburn University and Arizona State University. Erin Buckles, a Shirley C. Heim Middle School student, is also dual-rostered. She prides herself on her defense and also expressed confidence in the team’s chances this year, but is looking forward to more than just the chance to win. The biggest thing? “Watching a whole bunch of other teams play and meeting a whole bunch of other players,” Buckles said. The revamped Falcons haven’t produced a scholarship player yet, but Ali and Buckles represent the progress of the program and its potential. The more the Falcons can continue to grow, the more chance that they can spread awareness for families who don’t yet know they exist, who may not even realize that something like the Falcons is an option for their kids.